A businessman has set up a network of traders willing to provide refuge for people who feel in imminent danger of attack. 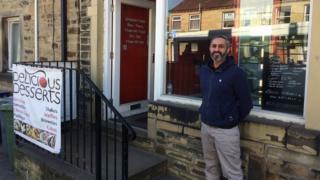 Huddersfield Safe Zones aims to offer places where teenagers and young adults can find sanctuary in the town. Waseem Naeem, of Delicious Desserts, said he had the idea following a "spate of stabbings" in the town, including a fatal attack on Tuesday. West Yorkshire Police said people who feel threatened should call 999. So far 12 businesses have agreed to take part, including a nail bar, a funeral parlour and a card shop. Mr Naeem said: "If people feel they're in danger they can come to us, if they need us to lock the door we can lock the door, if they need to use our phone to call their family or the authorities they can do." "If there's somebody who's in trouble, locks can go on and we can deal with it how we need to." West Yorkshire Police said: "Whilst we potentially welcome anything that keeps people safe, we would need to know more information about the scheme before we would be able to advise people to use it. "We would always urge people to call police on 999 in the first instance." A 42-year-old man died after he was found with stab wounds on New Hey Road in the early hours of Tuesday. A 39-year-old man from Huddersfield was arrested on suspicion of murder after the New Hey Road incident and is being questioned by police.